Reinhold Residential offers some of the most interesting places to live in Philadelphia. Our University City and Center City apartments feature the best in location and desired amenities. Modern kitchens and baths, warm, neutral finishes, and spacious open floor plans create captivating living spaces. But, it is truly the distinctive history and architectural details that set them apart from the rest. Transformed from former schools, factories and warehouses, each curated property tells a unique story. Once home to world-famous Wilbur Chocolate Company, the Chocolate Works features an interior courtyard fashioned from the original steel and timber frames, creating a living sculpture which can viewed form the lobby. Many apartments feature exposed wood beams and timbered ceilings. This five-story brick structure was built in 1903 for the Harrington Hoist Company and was typical of industrial buildings of the day. 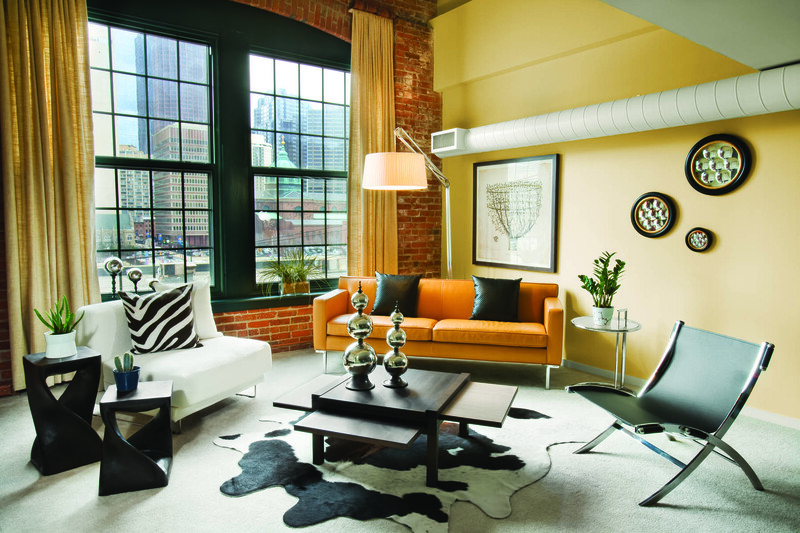 Today, most residences feature oversized industrial windows, high ceilings, exposed brick walls and timbered beams. An original overhead hoist remains in place in the spacious lobby. In 1910, acclaimed Detroit architect, Alfred Kahn, designed this showroom and assembly plant on Philadelphia’s “Automobile Row.” The limestone and terra cotta-trimmed building with its oversized windows, was unlike anything the city had seen before. Today, the classic limestone, terra cotta trim and hand carved cornices are still evident on the outside. Inside, the magnificent two-story lobby is one of the most spacious found in Philadelphia. And, the oversized industrial windows bathe each apartment in natural light. Famous French architect, Louis Jallade, created 26-story twin tower hotel which remains one of the best examples of Art Deco architecture in Philadelphia. On the outside, decorative arches and polychromatic terra cotta tiles rise about the city skyline for all to recognize. Inside, the property boosts a restored Art Deco basketball court with gallery seating. Dating back to the mid-19th century, this quaint mission house served as a meeting place for Quakers before becoming the office of The Working Home for the Blind. The larger structure was built in 1880 to house the residents. Today, the property offers wide shaded walkways and a building reminiscent of a 19th century park mansion.